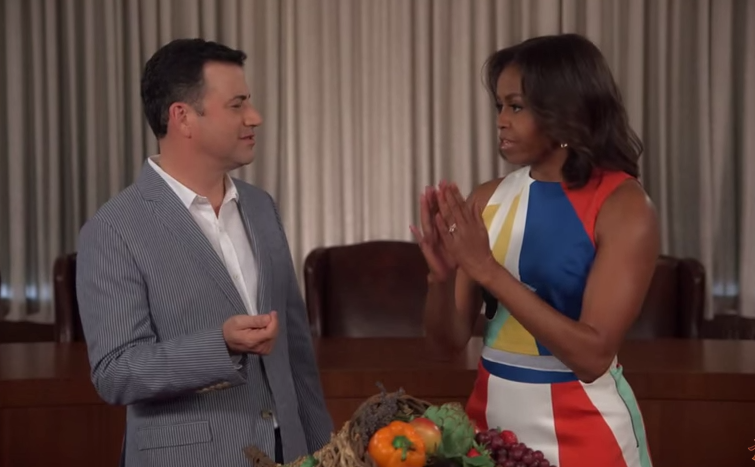 Michelle Obama was a guest on Jimmy Kimmel Live yesterday. 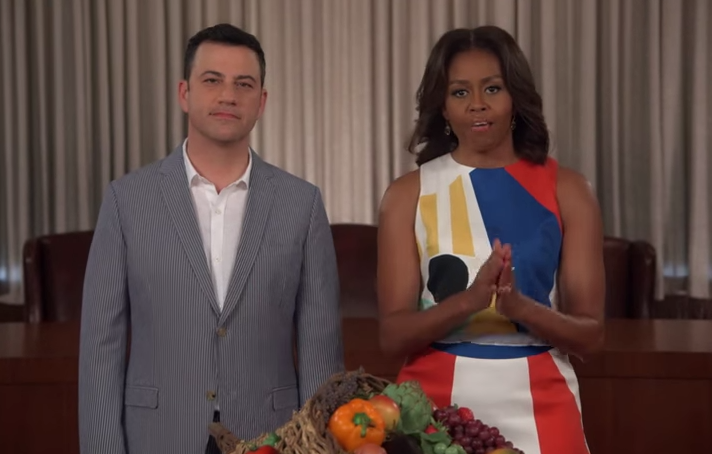 The first lady and Jimmy performed a little pseudo-public service announcement/comedy skit titled "Eat Your Effin Vees" (or Fs and Vs). There are very few other guests with whom such an act would be even a little funny - and most wouldn't consider it humorous here. It's more of a novelty because of her title. 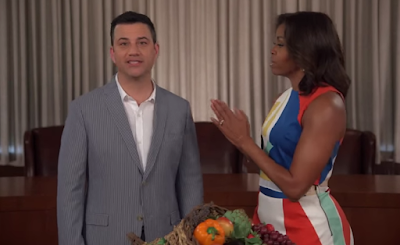 Michelle's role here is the "I know what's best for you" persona - which of course every first lady plays regardless of her political leanings. What Jimmy calls Effin Vees - Mrs. Obama knows as Fruits and Vegetables -of course in an effort to educate and encourage children into eating healthier. This certainly is a noble pursuit - yet that's not what was happening here. The First Lady repeatedly defaults to a very particular nonverbal - the pseudo-prayer (and a couple of its variants). While in some parts of the World, this body language is part of a greeting or departure of well-wishing - and of course in many religious contexts it accompanies prayer - yet on essentially all other occasions this false prayer gesture is highly indicative of patronizing and arrogant emotional tones and should, with rare exception, never be used. As with all alpha nonverbal signals, the pseudo-prayer will also engender feelings of increased power and authority in its user - yet the audience (whether a single person or millions) will instead feel condescending emotions. The pseudo-prayer is particularly potent in this patronizing characteristic. Moreover, when there is also a chopping motion accompanying the false-prayer - these negative emotional messages are amplified. Conversely, on several occasions Mrs. Obama held her hand surfaces parallel - but not quite touching. This nonverbal variation still carries all these same caustic emotions - although this modification modestly down-regulates the negativity of the gesture. Nonverbal Communication Analysis No. 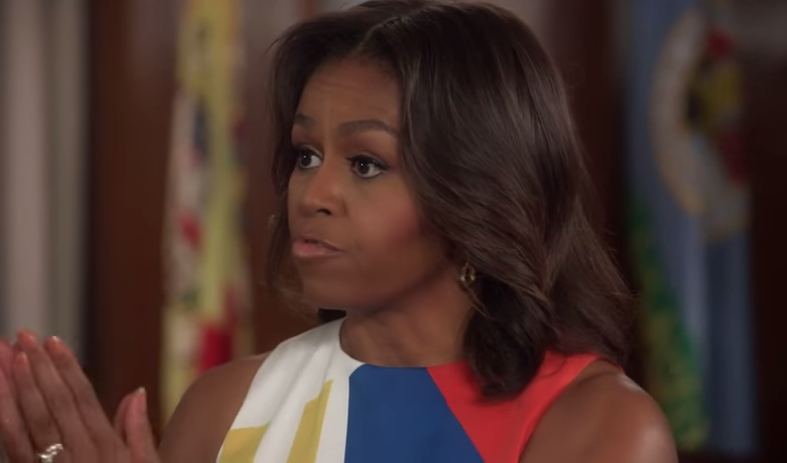 2276: Michelle Obama's Eye Roll .... What was she thinking? and What Did Boehner's & Barack's Body Language Say?